I once read somewhere that contouring is like Spanx for the face. Today’s post is all about my go-to contour, bronze and highlight palette which happens to be from City Color Cosmetics and is simply called their Contour Palette. I’ve been using this palette for a couple of months now and it’s such a beautiful palette- one that I think everyone must own! I love this palette…I think you should own this palette too! The Contour Palette comes in a nice black cardboard packaging with a magnetic closure, which makes it very light, handy and also travel-friendly. This palette has 3 x 0.159 oz. pans, one for Contouring, one for Bronzing and one for Highlighting. Be it a beginner or a professional, I feel this palette will be for everyone because the packaging actually shows you how to contour, bronze and highlight specific areas of the face. The powders in here are BUTTERY SOFT and the texture is something I’ve never felt before in a powder – perfection! Another thing I really appreciate in this palette is that both the Contour and the Bronzer are absolutely matte, whereas the Highlight is slightly shimmery. The powders are very pigmented, so you need to go in with a very light hand or you might end up with too much product on your face. That being said, these are a dream to blend and do not go patchy on the skin at all. 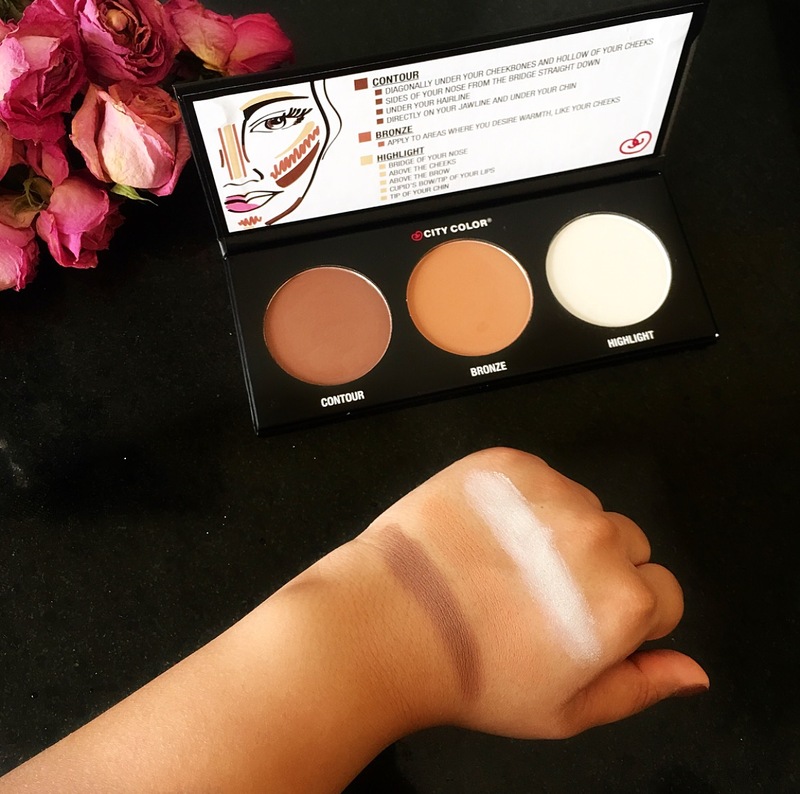 I love how the contour adds a striking shadow, whereas the bronzer is subtle and perfect for days when you just want that all over warmth on your skin. 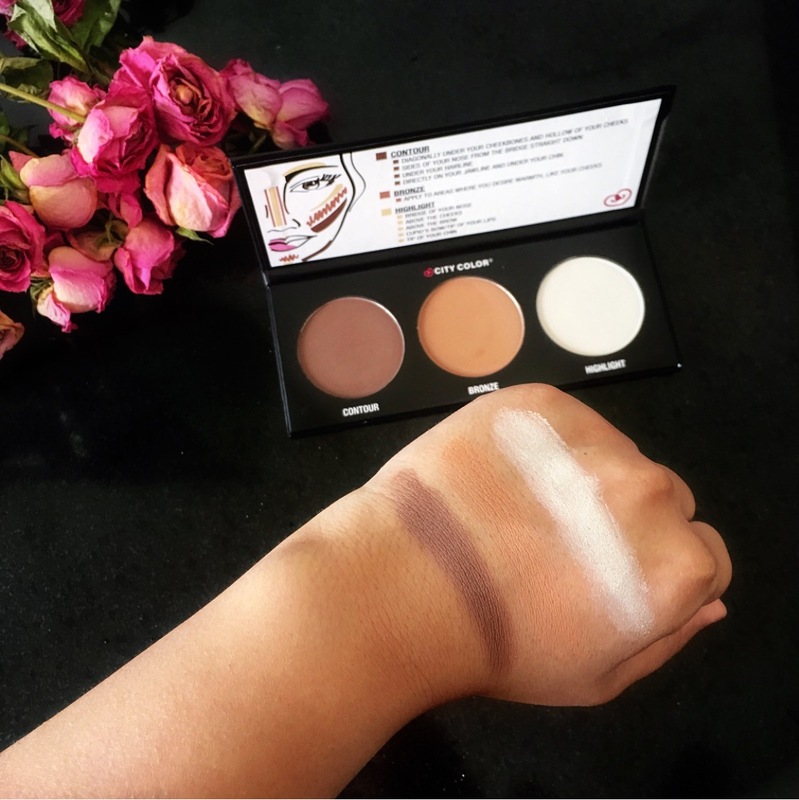 My only complaint with the City Colour Contour Palette is that there is no mirror in the palette and that the Highlight shade is a tad bit too pearly/white for my olive skin. The bronzer is matte too! This picture is after 8-10 hours of wear! Wears throughout the day! A mirror! I love palettes to have a mirror, even if it’s a small one because touch-ups on the go become so easy. I feel like the powders will smash if I ever drop this palette. The packaging could have been more sturdy. Overall, I love this palette and it is one that I reach for the most, especially on days when I have a full face of makeup on. There is no kickback or fall-out from this palette and that is something I really love about City Color Cosmetics – the quality is amazing. Do I think you need this palette in your life -YES!